The white, ground-up, hot root of horseradish is a zesty condiment in American cuisine. Native to southeastern Europe, horseradish (Armoracia rusticana) tastes so hot because the compound isothiocyanate oxidizes with air and saliva in your mouth. Wasabi also is a species of horseradish, native to eastern Asia, but it develops a green root. White horseradish roots are harvested anytime in fall, winter or early spring. Horseradish is a member of the mustard family, making it related to cabbage, cauliflower and radish vegetables. Horseradish grows as an herbaceous perennial with a slender, tapering, deep and branching taproot. It may be grown successfully anywhere in U.S. Department of Agriculture plant hardiness zones 3 through 10. Gardeners plant small, young horseradish roots in fall or early in spring. Over the summer, the roots enlarge as a tuft of glossy, leathery, dark green leaves form a rounded cluster about 2 to 3 feet tall. Once frosts occur in fall or winter, the foliage dies back; the plant remains alive but is dormant in its roots. Gardeners have two options for how to raise and harvest horseradish. If growing it as an annual that is dug up at the end of the growing season, wait until fall frost kills the foliage and then dig up the roots. Carefully retain any slender side root branches to plant next year. Gardeners who prefer to let horseradish plants grow as perennials dig up roots as needed anytime from fall to early spring. 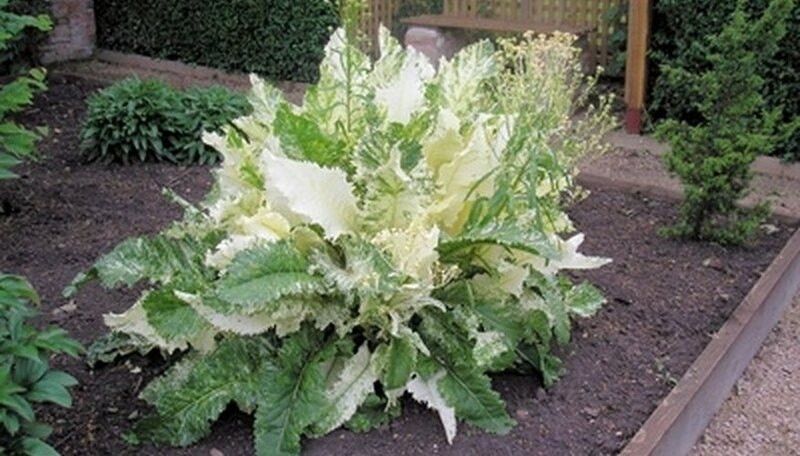 If you're overrun with horseradish plants, you could choose to eliminate plants in summer and harvest roots while the foliage goes to the compost pile. The root of the horseradish plant, not the leaves or flowers, is what's eaten. There is no seasonal signal or trick to know when to harvest. The potent and distinguishing smell of horseradish only occurs once the root is chopped up, so you don't get any olfactory hints from the plant in the garden that it's time to dig up roots. According to Sandra Mason, an extension horticulturist with the University of Illinois, the ideal root size is about 1 to 2 pounds. It takes a full growing season to obtain a root that large, so plan to harvest once fall frost kills the foliage. In cold winter areas, USDA zones 3 through 6, winter harvest is impossible because the soil is frozen. If you dig up horseradish root at an inopportune time for any reason, the roots store well. You can choose to replant a cutting of a long, slender side root branch, 12 to 18 inches long, in fall. Or you can wrap the dug up root in plastic wrap to conserve moisture and refrigerate it for several months, according to Mason.